Ryan Mahony’s life has been in a tailspin since her father was sentenced to serve time in prison. With her steadfast belief of his innocence, Ryan is still left with a void while he is away. She promises him that she will move to Dublin to live with her aunt and cousin, so she won’t be left entirely alone. Leaving her insular childhood home to live in the big city where there are dangers around every corner is a far cry from her what she is used to, but she vows to make the best of her situation while she is there. Ashley Dunne is a member of Dublin’s most ruthless gang, where selling drugs and breaking bones is all in a days work. But, his unfortunate extra-curricular activities in no way define the kind of man that he is. After the death of their mother, Ash is the only parent his younger brother has, and he takes his role as parent very seriously. 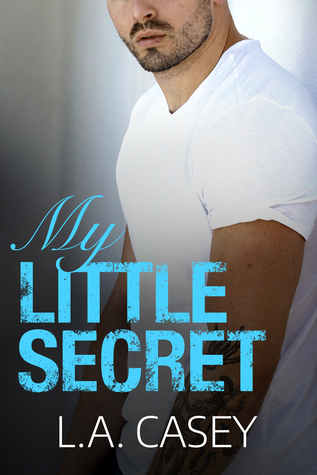 My Little Secret is a story of a sheltered girl who meets the bad boy with a heart of gold. Warned away from him from the very start, Ryan can’t help but interact with Ash when he refuses to leave her alone. When their good-natured flirting leads them to something more, Ryan and Ash’s journey to HEA is anything but easily won. Ryan may have been brought up with the finer things in life, but her isolated existence has left her lacking in the socializing department. Moving to Dublin comes with it’s own set of hurdles, but when she meets one of the people she was expressly told to stay away from, Ryan finds it impossible to avoid the enigmatic Ashley. Ash’s membership in the Disciples is not one the he celebrates. Making a mistake when he was a teenager has led to a life sentence of gang life. But, he makes due with what life has dealt him, and focuses on teaching his brother to be a good man, even when Ash himself has had to do some very bad things. He knows his infatuation with Ryan is something that could never go anywhere… she is a nice girl with a life that would only be ruined by associating with a man like him. But, his ability to stay away from her is quickly losing out to his need to spend every waking moment getting to know everything about her. L.A. Casey’s voice continues to be a delight of local dialect and life in Dublin, which combined with her entertaining writing and unique storylines, delivers with another great book. With some fantastic story elements and an entire cast of solid and interesting characters, this story was an enjoyable and fascinating read.